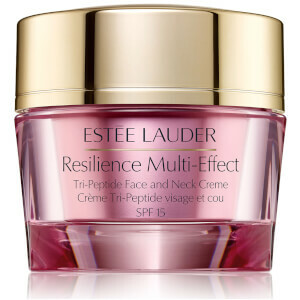 Revive the look of tired eyes with Estée Lauder Resilience Multi-Effect Tri-Peptide Eye Crème, an intensely nourishing eye cream that tackles signs of ageing and fatigue around the delicate eye area. The multi-effect eye treatment promotes a firmer, youthful, more lifted-looking eye contour, reducing the appearance of puffiness, lines, wrinkles, dark circles and crepiness. To encourage smoother-looking skin, the cream uses an advanced Tri-Peptide Complex which is proven in vitro testing to help significantly amplify collagen by 124% in just three days. Also contains protective antioxidants to help maintain firmness and tone, and innovative IR-Defense Technology to defend skin's moisture barrier against damage caused by infrared rays. Skin around the eyes appears plumper, radiant and intensely moisturised. Morgens und abends um die Augenpartie herum auftragen.